Holmgren, Eric J.. "Walter Moberly". The Canadian Encyclopedia, 16 December 2013, Historica Canada. https://www.thecanadianencyclopedia.ca/en/article/walter-moberly. Accessed 18 April 2019. Walter Moberly, civil engineer (b at Steeple Aston, Eng 15 Aug 1832; d at Vancouver 14 May 1915). He came to Canada as a child and studied in Canada W, later moving to BC. Walter Moberly, civil engineer (b at Steeple Aston, Eng 15 Aug 1832; d at Vancouver 14 May 1915). He came to Canada as a child and studied in Canada W, later moving to BC. In 1859 he was appointed superintendent of public works and in 1862 was involved in the construction of the Yale-Cariboo wagon road (see CARIBOO ROAD). He was assistant surveyor general of BC 1864-66 and then spent 4 years in the US. In 1871 he was in charge of surveys for the route of the CPR through the Rocky Mountains and was the discoverer of EAGLE PASS. 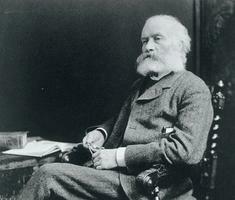 He published his reminiscences, The Rocks and Rivers of British Columbia, in 1885.